After seeing the CLAP Digital Camera by Powershovel, you could say that it is a small world after all, especially when it comes to technology. Japanese design studio, Powershovel, has come up with a mini digital camera it named CLAP. Where the name CLAP comes from is a mystery but based on the designer’s website, it appears that they want you to “clap” your hands for the product. But let’s take a closer look before we give it a round of applause. The flash drive mini camera is so small in size that it only measures 1.4 x 2.8 x.59 inches and weighs 24 grams. The Superheadz CLAP Digital Camera Powershovel uses a very small 2 Megapixels F2.8 (3.22mm) lens; however the small size isn’t enough for it to have a viewfinder and an LCD so you’d have to make an educated guess to point it at the right angle. This little USB camera can shoot images at 1280×1024 resolutions, then save it in JPEG, and can record videos at 720×480 resolutions, then save it in AVI. At 16GB, there should be a lot of images and a handful of videos you can save. The CLAP camera comes with a USB connector. In fact, at first glance, without its lid you’d probably think it’s a flash drive. It features a built-in Li-ion battery that can be charged via USB just like your other peripherals. The miniature device also comes with a microSD card slot which can support up to 16GB. The male USB is also used for conveniently transferring files directly from the camera to your PC. Unfortunately, it’s priced for its capabilities rather than its features—the $50 price tag does not include the MicroSD memory card. Needless to say, this isn’t for professional photography and is better suited for quick snapshots or for the spy who loves gadgets. Powershovel made it look minimalistic. It’s the kind of tool that can fit easily into a pocket or purse. It seems to me that the real aim was really to have a digital camera that’s ultimately portable. Additionally, there’s a tiny hole meant for a lanyard or key ring that will prevent the mini camera from getting lost. 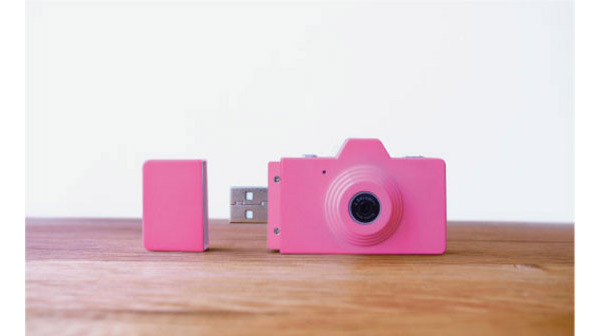 Small, sweet and adorable, the mini camera comes in 6 different colors: white, pink, black, light blue, red, and orange. It is available on Amazon, and at Tokyo-based website, Superheadz. Are these the mini USB cameras worthy of applause? Tell us what you think! This entry was posted in Articles, CLAP USB Camera, Powershovel, USB Digital Cameras, USB Gadgets and tagged CLAP camera, Clap Mini Digital Camera, Mini Digital Camera USB Key, mini USB cameras, Powershovel CLAP Digital Camera, Powershovel CLAP USB Camera, Powershovel Clap Your Hands, Superheadz, Superheadz CLAP Digital Camera Powershovel. Bookmark the permalink. The idea of mini camera is wonderful, but if the camera could be fitted in glasses, it would be perfect.